St Patrick’s Festival in Dublin has over 500,000 spectators on the streets and a worldwide television audience – it does not get much bigger than this! 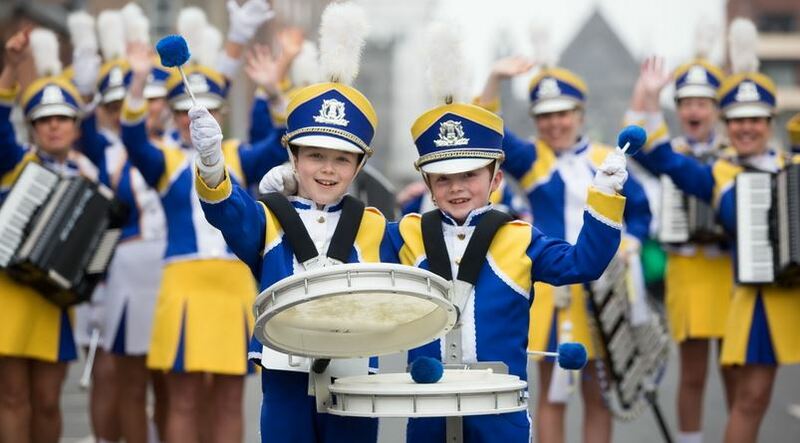 In addition to the parade in Dublin, your Band can compete in the International Band Competition in Limerick as well performing in towns and cities around Ireland. Let us take your band on an experience that they will never forget as we visit and perform in the cities, ancient sites, and rugged coastline of Ireland. 7 nights hotel accommodations with full Irish or Continental breakfast served daily. Evening meals at your hotel and local Irish restaurants. Dinner & Entertainment at Taylor’s Three Rock. Admissions: Rock of Cashel, Blarney Castle, Cliffs of Moher, Bunratty Castle, Trinity College, St. Patrick’s Cathedral. Performances: Cobh Promenade, Limerick International Band Championship, St. Patrick’s Festival, Kilkenny Castle Grounds. Itineraries and performances are subject to change. All marching band itineraries are prepared on a custom basis. Accommodation and other reservations cannot be held until the initial deposit is received. Cead Míle Failte (One Hundred Thousand Welcomes) to Ireland!! On arrival, your group will be met by your tour director who will stay with you for the entire tour. 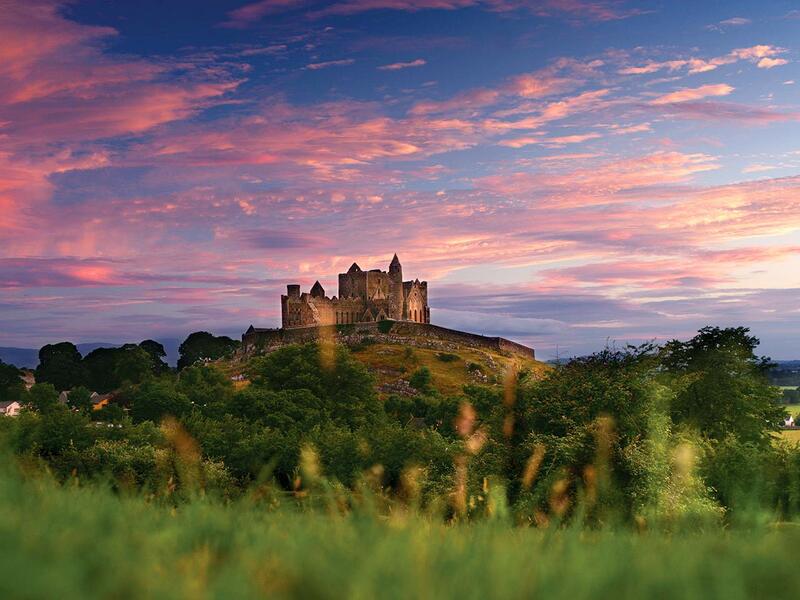 We’ll travel to Cork City via the ancient seat of the High Kings of Munster, The Rock of Cashel. This 4th-century fortress is one of the most enduring images of Ireland, with its amazing collection of ancient walls, towers and halls, and an excellent multilingual audiovisual presentation. What a way to start your experience in Ireland! We’ll travel on to our home for the next two nights, and what the locals call “The Real Capital of Ireland!” Steeped in history, Cork City is fast gaining a reputation as one of Europe’s hippest cities. Like Venice, the city is built upon water, and the city centre is built on an island in the River Lee, just upstream of Cork Harbour. The two channels of the River Lee which embrace the city centre are spanned by many bridges, and this gives the city a distinctive continental air. 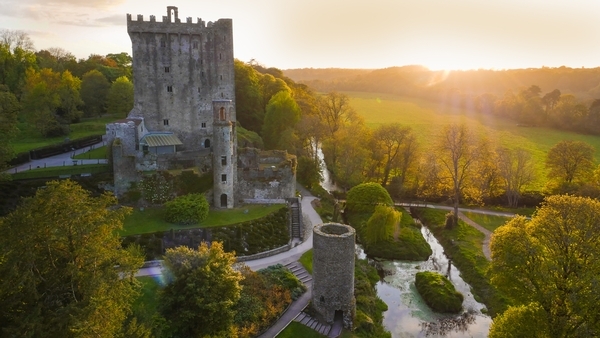 After a full Irish breakfast at your hotel we’ll travel on to one of the most famous locations in Ireland, Blarney Castle. This castle was built nearly six hundred years ago by one of Ireland’s greatest chieftains, Cormac MacCarthy, and has been attracting attention beyond Munster ever since. Over the last few hundred years, millions have flocked to Blarney, making it a world landmark and one of Ireland’s greatest treasures. Now that might have something to do with the Blarney Stone, the legendary Stone of Eloquence, found at the top of our Tower. Kiss it and you’ll never again be lost for words. Next, we’ll visit the beautiful town of Cobh (Cove). We’ll walk through the streets and environs of Cobh, revealing locations and incidents directly connected to the Titanic and many other aspects Cork harbour history and Irish heritage. Highlights include: Original buildings, streets and piers associated with Titanic, The actual pier where Titanic passengers departed from, St. Colmans Cathedral, The Lusitania Peace Memorial, The Titanic Monument, Emigrant, military and maritime history, The story of Spike Island & The Famine, Convict Transportation. Performance: The Band will perform on the Promenade after the Walking Tour followed by a reception for the group. 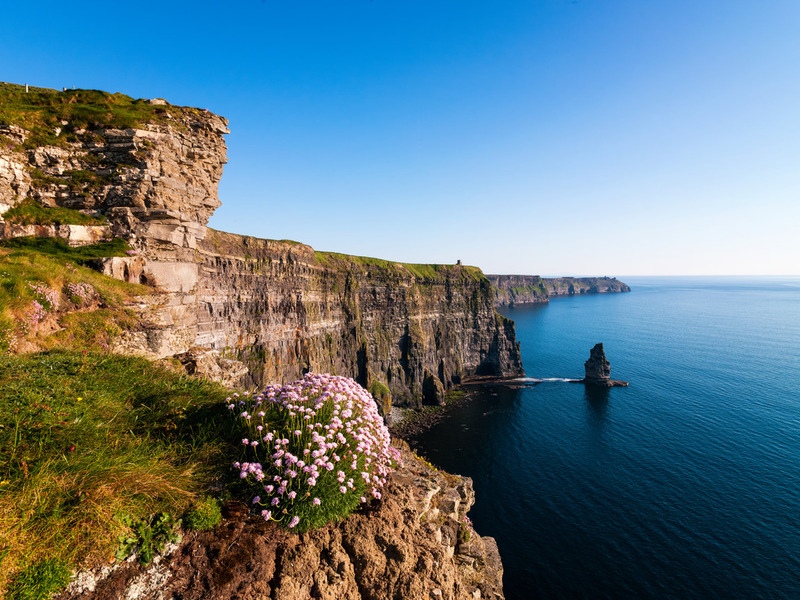 This morning we’ll travel along the Wild Atlantic Way to see the world famous Cliffs of Moher. Along the way, we’ll see some of the most spectacular scenery Ireland has to offer and will even take a ferry across part of that rugged coastline. At the cliffs, we’ll step on to the edge of the world and into an awe-inspiring view that dreams are made of. You will encounter nature in its wildest, purest form – see the rugged cliffs facing the mighty ocean, taste the salt air, hear the birds cry, feel the ancient rocks beneath your feet, and smell the wind. From the cliffs, we’ll begin making our way to Limerick City stopping off at Bunratty Castle on the way. Bunratty Castle is the most complete and authentic medieval castle in Ireland. Built in 1425, it was restored in 1954 to its former medieval splendour and now contains mainly 15th and 16th-century furnishings, tapestries, and works of art which capture the mood of those times. We’ll travel on to our hotel for the night and here we’ll have dinner and rest before tomorrow’s Limerick International Band Championships. Ireland’s only international band competition will start at midday before ending with a free concert for the public in Arthur’s Quay Park where the winners will be announced! Prizes will be awarded for the overall champions, best uniforms, best musical performance, most entertaining performance, best local band, best youth band, best international band, ‘Mayors Prize’, the special judges’ award and special commendation prizes awarded at the judge’s discretion. We’ll take some time to relax at leisure in the afternoon and then celebrate your performance with some of the local bands that evening. Today we’ll travel on to Ireland’s capital city Dublin. Dublin is one of the friendliest cities in the world. Founded in the 9th century, the city is proud of its Viking past and its streets and buildings are a living museum of its history since then, with medieval castles and cathedrals on display alongside the architectural splendours of the 18th-century when Dublin was the most handsome Georgian city of the British Empire. 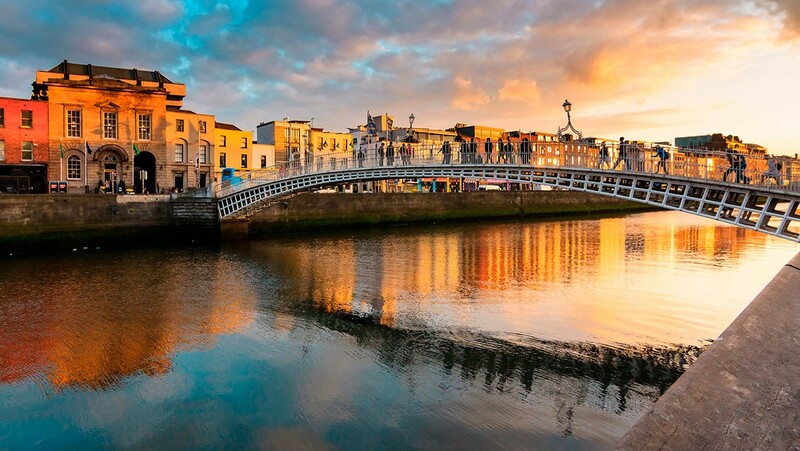 On our tour today you will experience Dublin in its own unique way, from the famous highlights to it’s hidden gems. On our way to Dublin, we’ll stop at the historic city of Kilkenny where we’ll have the opportunity to perform in the grounds on Kilkenny Castle. Kilkenny is the Ireland of many visitors’ imaginations. Built from dark-grey limestone flecked with fossil seashells, Kilkenny (from the Gaelic ‘Cill Chainnigh’, meaning the Church of St Canice) is also known as ‘the marble city’. Its picturesque ‘Medieval Mile’ of narrow lanes and historic buildings strung between castle and cathedral along the bank of the River Nore is one of the southeast’s biggest tourist draws. It’s worth braving the crowds to soak up the atmosphere of one of Ireland’s creative crucibles – Kilkenny is a centre for arts and crafts, and home to a host of fine restaurants, cafes, and shops. Lá Fhéile Pádraig Sona Duit!! – Happy St. Patrick’s Day!! Today you’ll participate in both the St Patrick’s Day Parade in Dublin, followed by the Parade in Celbridge, Co. Kildare. The 2020 Festival Parade will weave its way through the heart of the capital city in a flourish of colour and flair. 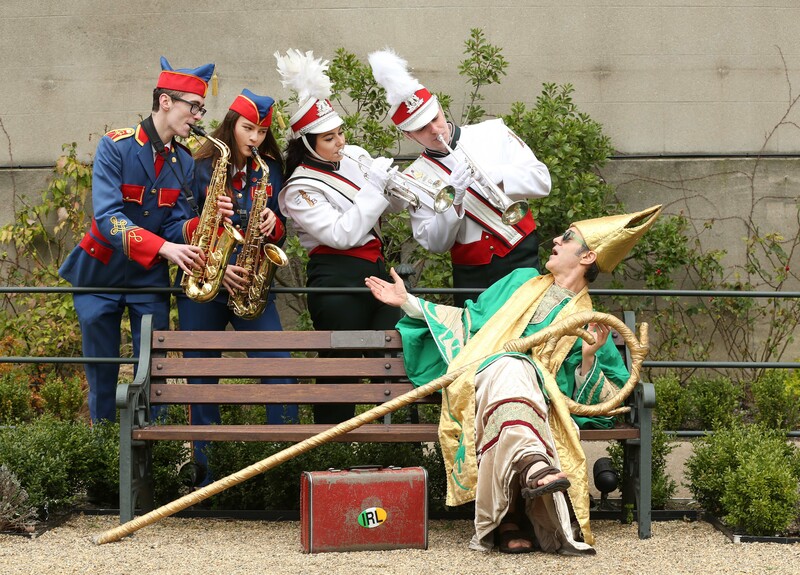 Ireland’s finest street-theatre companies will swirl by with fantastical pageantry and raucous performances. Bands from Ireland will be joined by music ensembles from around the world and deliver uplifting rhythms for the spectacular procession. The community of Celbridge hosts an annual St. Patrick’s Parade, which has is recent years become the envy of community parades around Ireland. With it’s proximity to Dublin City, this town has become the second parade for many bands and artists to continue their celebrations after the Dublin City Parade has finished! Today will be your last full day in Ireland. What better way to spend it than exploring Dublin City. This moring we’ll visit Ireland’s most prestigious university, This university is a retreat in the heart of the city that may put you in mind of the great universities like Oxford, Cambridge and Harvard. 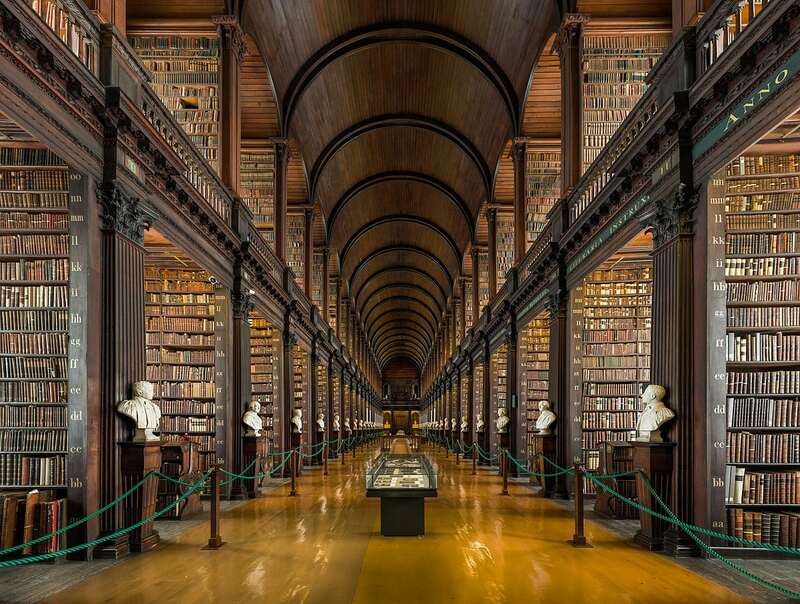 The college’s greatest treasures, however, the Book of Kells and the Long Room are housed within the Old Library. The Book of Kells is Ireland’s greatest cultural treasure and the world’s most famous medieval manuscript. The 9th-century book is a richly decorated copy of the four Gospels of the life of Jesus Christ. We’ll then move on to visit St. Patrick’s Cathedral. Since Saint Patrick baptised Christian converts nearby over 1500 years ago, this site has been a place of spiritual encounter for countless generations. As the largest cathedral and one of the most important pilgrimage sites in Ireland, Saint Patrick’s has been at the heart of Dublin and Ireland’s history and culture for over 800 years. Its story is a microcosm of the story of Ireland. We’ll take a tour of this beautiful landmark to learn more about the development of the Cathedral and the fascinating characters who make its story what it is today. After some free time in Dublin’s city centre for shopping and gift getting, we’ll make our way to a very special farewell dinner at the famous Taylor’s Three Rock Restuarant. Ireland’s most loved pub and entertainment venue Taylors Three Rock involves a rip-roaring evening of traditional Irish song and dance accompanied by a great selection of quality Irish food to delight your palate. The resident band and traditional Irish Dancers provide breath-taking performances for their audience and never fail to entertain. Day 8: Slán Leat- Goodbye for now! Your hotel is only a short distance from Dublin Airport. We hope that you will have had a memorable and enjoyable experience!